History isn’t usually a subject for comedy, especially when it has to do with state-imposed terror and mass murder. Yet there are filmmakers who have proven that their way to confront politics past and present is through skewering mockeries, presenting events as they might have happened but with considerable absurd humor and foul language thrown in. For the man behind the Oscar-nominated film “In the Loop” and the Emmy-winning series “Veep,” it’s no surprise that he might tackle a seemingly unfunny subject – life in Russia under Joseph Stalin – and deliver something perfectly on par with his previous work. 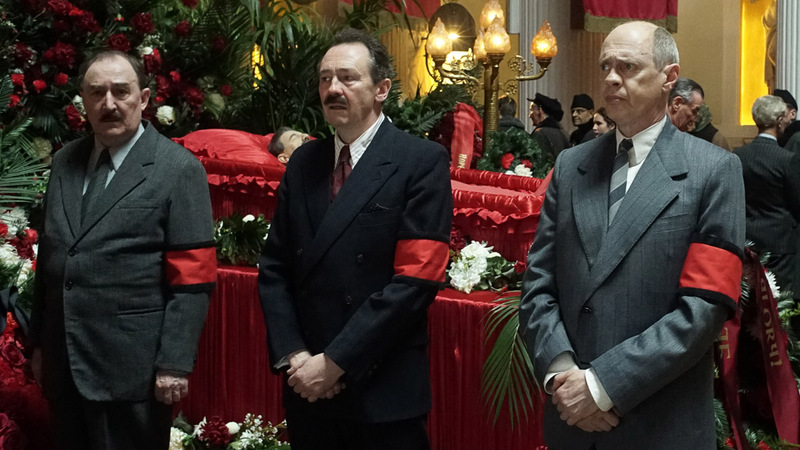 It’s 1953, and Stalin (Adrian McLoughlin) is surrounded by a group of advisors that includes Nikita Khrushchev (Steve Buscemi), Georgy Malenkov (Jeffrey Tambor), Vyacheslav Molotov (Michael Palin), and Lavrentiy Beria (Simon Russell Beale). When their comrade leader is found dead, everyone close to him scrambles to usurp power, pitting Beria, the vicious director of his security forces, against the scheming Khrushchev. 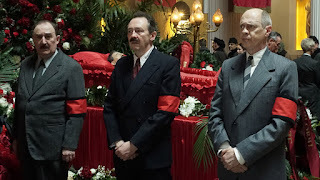 Contending with Stalin’s outspoken children, Svetlana (Andrea Riseborough) and Vasily (Rupert Friend), and the charismatic leader of the army, Georgy Zhukov (Jason Isaacs), these men must determine how to go on in – or possibly against – the spirit of their late leader. Iannucci’s work has often presented hilarious moments in situations that, when reflected upon, really aren’t so humorous, and he occasionally comes into contact with more dramatic material. Little is filtered here, and as a result there is a considerable amount of disturbing content that isn’t censored for this humorous presentation. 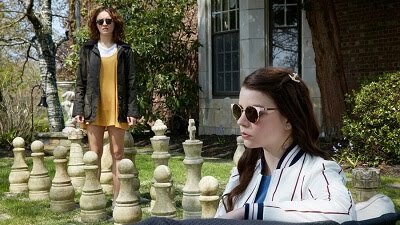 It’s the people involved who are mocked relentlessly by their portrayals by comic American actors, and the presentation of off-putting material as the framework for the film’s comedy makes it all the more effective since it grounds it in something partially true to life though obviously exaggerated in an enormous way. This film is full of great actors, all of whom contribute with hilarious performances. Buscemi is closest to the film’s lead, and he does a tremendous job of attempting to steer the ship in his character’s direction. Beale is superb, chewing scenery as the man behind the scenes who is really in charge. Isaacs makes a particularly strong impression, suggesting that the actor known for dramatic roles in “Brotherhood” and “The OA” should really do more comedy. The script is sharp and endlessly entertaining, and this film shines as an argument that Iannucci should make more films like this, shaping history to his comic whims.